The event was very successful. The vehicles at the event included Tesla Model S, Tesla Roadster, Fiat 500 electric, smart electric drive, Nissan LEAF, Ford Focus EV, Ford Plug In hybrid, Coda, Fisker Karma, 2013 Toyota RAV4 EV, Via Plug In Hybrid Trucks, Chevy Volt, Chevy Spark EV. Pontiac Fiero EV conversion, Honda Fit EV, Plug In Prius, Zero electric motorcycles, and Brammo electric motorcycles. Charging stations from Schneider Electric were on display and charging station information was distributed by NRG eVgo. Information about residential solar systems for EV charging was provided by Luminalt. Information on special electricity rates for charging EVs was distributed by PG&E and Marin Energy Authority. Cool The Earth provided information on its programs to promote electric vehicles to families with children in elementary schools. Damon Connolly, San Rafael City Council member presented a Plug In Day proclamation. 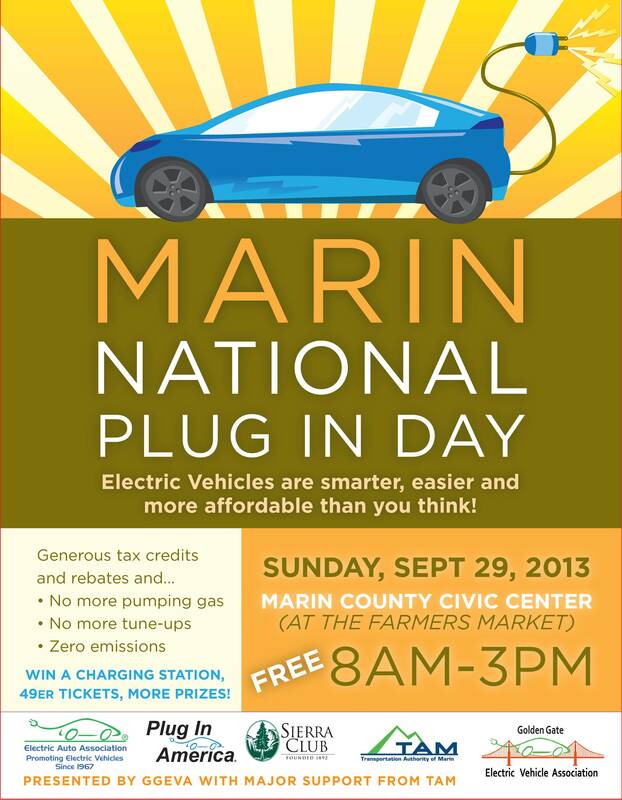 The Marin National Plug In Day celebration is being presented by Golden Gate Electric Vehicle Association with major sponsorship by the Transportation Authority of Marin. Test drives of nearly a dozen different vehicles will be offered by local plug in vehicle dealers. Plug-in vehicle drivers will be displaying their cars and describing how they have benefited from driving a plug-in. The event will be held from 8:00 AM to 3:00 PM next to the Sunday Farmers Market, the third largest farmers market in California. In addition to the opportunity to learn how driving electric is fun, economical, and environmentally friendly, attendees will have an opportunity to win tickets to a San Francisco 49ers game courtesy of NRG eVgo, an EVlink charging station courtesy of Schneider Electric, and free installation of a residential charging station courtesy of Luminalt Solar Energy Solutions. Fast charge will be available for NIssan LEAF drivers and J1772 charging stations are nearby.